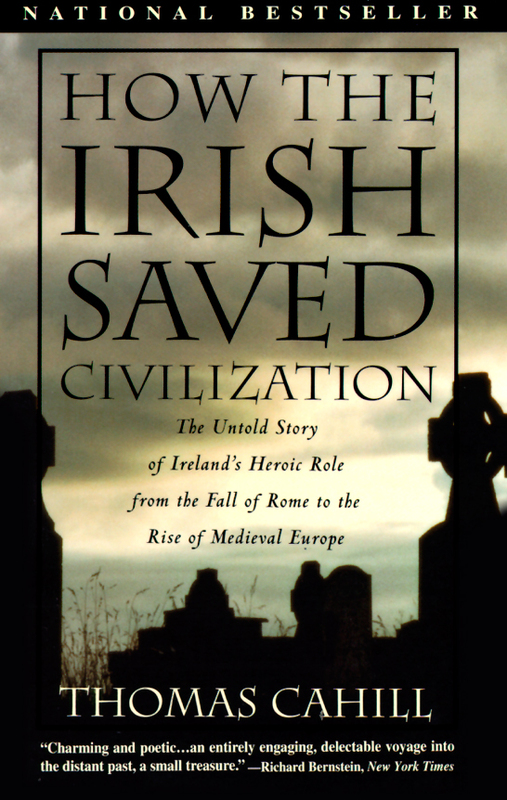 The perfect St. Patrick's Day gift, and a book in the best tradition of popular history—the untold story of Ireland's role in maintaining Western culture while the Dark Ages settled on Europe. Every year millions of Americans celebrate St. Patrick's Day, but they may not be aware of how great an influence St. Patrick was on the subsequent history of civilization. Not only did he bring Christianity to Ireland, he instilled a sense of literacy and learning that would create the conditions that allowed Ireland to become "the isle of saints and scholars"—and thus preserve Western culture while Europe was being overrun by barbarians. 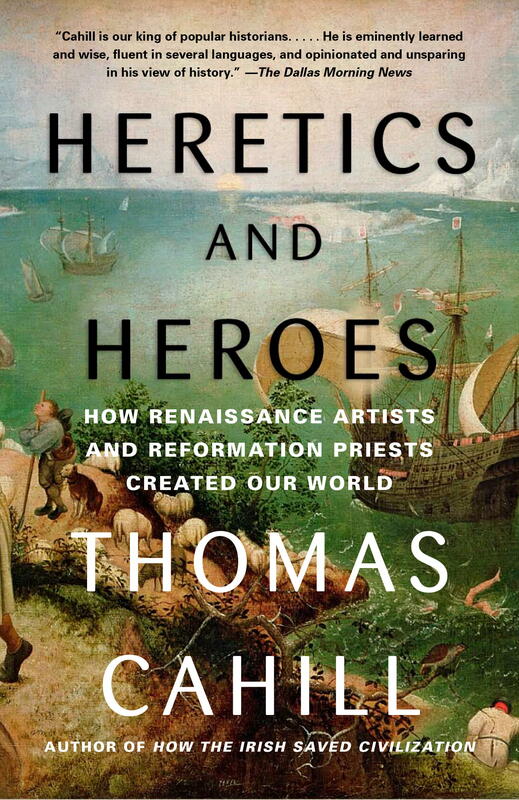 In this entertaining and compelling narrative, Thomas Cahill tells the story of how Europe evolved from the classical age of Rome to the medieval era. Without Ireland, the transition could not have taken place. Not only did Irish monks and scribes maintain the very record of Western civilization—copying manuscripts of Greek and Latin writers, both pagan and Christian, while libraries and learning on the continent were forever lost—they brought their uniquely Irish world-view to the task. Click here to view a timeline from How the Irish Saved Civilization. The word Irish is seldom coupled with the word civilization. When we think of peoples as civilized or civilizing, the Egyptians and the Greeks, the Italians and the French, the Chinese and the Jews may all come to mind. The Irish are wild, feckless, and charming, or morose, repressed, and corrupt, but not especially civilized. If we strain to think of "Irish civilization," no image appears, no Fertile Crescent or Indus Valley, no brooding bust of Beethoven. The simplest Greek auto mechanic will name his establishment "Parthenon," thus linking himself to an imagined ancestral culture. A semiliterate restaurateur of Sicilian origin will give pride of place to his plaster copy of Michelangelo's David, and so assert his presumed Renaissance ties. But an Irish businessman is far more likely to name his concern "The Breffni Bar" or "Kelly's Movers," announcing a merely local or personal connection, unburdened by the resonances of history or civilization. And yet . . . Ireland, a little island at the edge of Europe that has known neither Renaissance nor Enlightenment—in some ways, a Third World country with, as John Betjeman claimed, a Stone Age culture had one moment of unblemished glory. For, as the Roman Empire fell, as all through Europe matted, unwashed barbarians descended on the Roman cities, looting artifacts and burning books, the Irish, who were just learning to read and write, took up the great labor of copying all of western literature—everything they could lay their hands on. These scribes then served as conduits through which the Greco-Roman and Judeo-Christian cultures were transmitted to the tribes of Europe, newly settled amid the rubble and ruined vineyards of the civilization they had overwhelmed. Without this Service of the Scribes, everything that happened subsequently would have been unthinkable. Without the Mission of the Irish Monks, who single-handedly refounded European civilization throughout the continent in the bays and valleys of their exile, the world that came after them would have been an entirely different one—a world without books. And our own world would never have come to be. Not for a thousand years—not since the Spartan Legion had perished at the Hot Gates of Thermopylae had western civilization been put to such a test or faced such odds, nor would it again face extinction till in this century it devised the means of extinguishing all life. As our story opens at the beginning of the fifth century, no one could foresee the coming collapse. But to reasonable men in the second half of the century, surveying the situation of their time, the end was no longer in doubt: their world was finished. One could do nothing but, like Ausonius, retire to one's villa, write poetry, and await the inevitable. It never occurred to them that the building blocks of their world would be saved by outlandish oddities from a land so marginal that the Romans had not bothered to conquer it, by men so strange they lived in little huts on rocky outcrops and shaved half their heads and tortured themselves with fasts and chills and nettle baths. As Kenneth Clark said, "Looking back from the great civilizations of twelfth-century France or seventeenth-century Rome, it is hard to believe that for quite a long time—almost a hundred years—western Christianity survived by clinging to places like Skellig Michael, a pinnacle of rock eighteen miles from the Irish coast, rising seven hundred feet out of the sea." Clark, who began his Civilisation with a chapter (called "The Skin of Our Teeth") on the precarious transition from classical to medieval, is an exception in that he gives full weight to the Irish contribution. Many historians fail to mention it entirely, and few advert to the breathtaking drama of this cultural cliffhanger. This is probably because it is easier to describe stasis (classical, then medieval) than movement (classical to medieval). It is also true that historians are generally expert in one period or the other, so that analysis of the transition falls outside their—and everyone's?—competence. At all events, I know of no single book now in print that is devoted to the subject of the transition, nor even one in which this subject plays a substantial part. In looking to remedy this omission, we may as well ask ourselves the big question: How real is history? Is it just an enormous soup, so full of disparate ingredients that it is uncharacterizable? Is it true, as Emil Cioran has remarked, that history proves nothing because it contains everything? Is not the reverse side of this that history can be made to say whatever we wish it to? I think, rather, that every age writes history anew, reviewing deeds and texts of other ages from its own vantage point. Our history, the history we read in school and refer to in later life, was largely written by Protestant Englishmen and Anglo-Saxon Protestant Americans. Just as certain contemporary historians have been discovering that such redactors are not always reliable when it comes to the contributions of, say, women or African Americans, we should not be surprised to find that such storytellers have overlooked a tremendous contribution in the distant past that was both Celtic and Catholic, a contribution without which European civilization would have been impossible. To an educated Englishman of the last century, for instance, the Irish were by their very nature incapable of civilization. "The Irish," proclaimed Benjamin Disraeli, Queen Victoria's beloved prime minister, "hate our order, our civilization, our enterprising industry, our pure religion [Disraeli's father had abandoned Judaism for the Church of England]. This wild, reckless, indolent, uncertain and superstitious race have no sympathy with the English character. Their ideal of human felicity is an alternation of clannish broils and coarse idolatry [i.e., Catholicism]. Their history describes an unbroken circle of bigotry [!] and blood." The venomous racism and knuckle-headed prejudice of this characterization may be evident to us, but in the days of "dear old Dizzy," as the queen called the man who had presented her with India, it simply passed for indisputable truth. Occasionally, of course, even the smug colonists of the little queen's empire would experience a momentary qualm: Could the conquerors possibly be responsible for the state of the colonized? But they quickly suppressed any doubt and wrapped themselves in their impervious superiority, as in this response by the historian Charles Kingsley to the famine-induced destitution he witnessed in Victorian Ireland: "I am daunted by the human chimpanzees I saw along that hundred miles of horrible country. I don't believe they are our fault [emphasis mine]. I believe that there are not only many more of them than of old, but that they are happier, better and more comfortably fed and lodged under our rule than they ever were. But to see white chimpanzees is dreadful; if they were black, one would not feel it so much, but their skins, except where tanned by exposure, are as white as ours." Nor can we comfort ourselves that such thinking passed long ago from the scene. As the distinguished Princeton historian Anthony Grafton wrote recently in The New York Review of Books of history departments at the better American universities: "Catholic culture—like most Catholics—was usually disdained, as the province of lesser breeds fit only for the legendary parochial schools where nuns told their charges never to order ravioli on a date, lest their boy friends be reminded of pillows. Stereotypes and prejudices of this kind, as nasty as anything fastened upon Jews, persisted in American universities until an uncomfortably recent date." The Man once invited the Lion to be his guest, and received him with princely hospitality. The Lion had the run of a magnificent palace, in which there were a vast many things to admire. There were large saloons and long corridors, richly furnished and decorated, and filled with a profusion of fine specimens of sculpture and painting, the works of the first masters in either art. The subjects represented were various; but the most prominent of them had an especial interest for the noble animal who stalked by them. It was that of the Lion himself; and as the owner of the mansion led him from one apartment into another, he did not fail to direct his attention to the indirect homage which these various groups and tableaux paid to the importance of the lion tribe. There was, however, one remarkable feature in all of them, to which the host, silent as he was from politeness, seemed not at all insensible; that diverse as were these representations, in one point they all agreed, that the man was always victorious, and the lion was always overcome. It is not that the Lion has been excluded from the history of art, but rather that he has been presented badly—and he never wins. When the Lion had finished his tour of the mansion, continues Newman, "his entertainer asked him what he thought of the splendours it contained; and he in reply did full justice to the riches of its owner and the skill of its decorators, but he added, 'Lions would have fared better, had lions been the artists.'" In the course of this history, we shall meet many entertainers, persons of substance who have their story to tell, some of whom may believe that their story is all there is to tell. We shall be gracious and give them a hearing without disparagement. We shall even attempt to see things from their point of view. But every once in a while we shall find ourselves entertaining lions. At which moments, it will be every reader for himself. We begin, however, not in the land of lions, but in the orderly, predictable world of Rome. For in order to appreciate the significance of the Irish contribution, we need first to take an inventory of the civilized empire of late antiquity. 1. As the author notes, most historians describe periods of stasis, not movement, so that we miss out on the transition periods of history. Discuss this in light of the story the author tells in this book. 2. The author often gives us tableaus where he slips deep into the scene as it's happening—the Roman soldiers facing the German tribes along the banks of the frozen Rhine, for instance. Talk about how he does this and how it depends on our understanding of the history he reports. 3. The possibility of "psychological fiction" [p. 41] came about because of Augustine's Confessions. Discuss this breakthrough to the personal in prose. 4. The author gives a picture of Irish character that spans prehistoric to current times. Discuss character as a trait rooted in or heavily influenced by geography, weather, and culture. 5. Ireland, an island, had fewer outside influences on it than did many other cultures during the Pax Romana. Discuss isolation as a protective force, and a contributor to the idea that as Roman lands went from "peace to chaos," Ireland went from "chaos to peace" [p. 124]. 6. Talk about the particular Irish women presented in this book—Medb, Derdriu, Brigid of Kildare, and Dark Eileen O'Connell—and the general Irish view of the role of women. 7. Discuss the difference between Patrick and Augustine's "emotional grasp of Christian truth" [p. 115]. 8. Talk about the Irish people's ability to enjoy magic and superstition and pagan influences and yet convert wholeheartedly to Christianity. 9. Christianity was "received into Rome," while Ireland was "received into Christianity" [p. 148]. Discuss the difference and its implications and results. 10. As Columcille and Columbanus traveled in Europe and converted people to Christianity and established monasteries, they worked under the rubric of a democratic principle that "a man is better than his descent" [p. 176]. Discuss this as a change in previous and subsequent spiritualities, such as that of Augustine and the Rule of Saint Benedict. 11. Is power always corrupt? Discuss this in light of the Church conspiring with the enemy (Brunhilda) against its own messenger, Columbanus, and his Irish monks. 12. Discuss the cause and effect of the clash between the Roman Christianity of Augustine's Canterbury and Celtic Christianity at the Synod of Whitby in A.D. 644. 13. Discuss how the intellectual Greek approach to thought died and the price that subsequent cultures paid for it at the Synod of Whitby or elsewhere. 14. Discuss De Divisione Naturae, John Scotus Eriugena's theory of nature and reality, and Pope Honorius III's order to burn all copies of it. From what the author presents here, talk about the difference between pantheism and what Scotus suggested. 1. Each book gives a piece that helps complete the picture of who we are, of our history, of our humanity and acts as a piece in a puzzle. How effective is this type of a reckoning of our past? 2. The author did not write the books in his series in strict chronological order. Instead he traces large cultural movements over many centuries. How does this choice affect the understanding of each book as a piece in the puzzle? Or as an individual work? 3. In his books, the author gets inside the heads and hearts of his subjects, using a very close third-person point of view. How does this choice strengthen his premise? Does it have limitations? 4. The author is Roman Catholic. Is he able to present these histories without being biased by his Catholicism? Does one's religion (or lack of it) necessarily constrict or color one's view? 5. Discuss the nature and history of the Irish and the Jews as read in these books. What are their ambitions, their differences? How do they differ from the Romans and the Greeks in all three books?